The Brewista Smart Brew™ 750 ml Hourglass Brewer. Its innovative dual spout design provides smooth pouring without splashing. The ergonomically designed profile and no-slip, heat resistant silicone wrap make it easy to handle. Extrusions on the interior of the vessel prevent filters from sticking when wet, so removing grounds is simple and neat when you are ready to pour. Durable tempered borosilicate glass maintains temperature without cracking under quick temperature changes. The generous 750 ml size allows for your to brew up to 5 cups at a time. 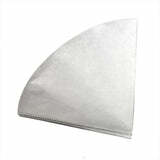 Fits standard #4 cone style coffee filters. Place cursor on image, click and hold left button, then move mouse to rotate product. Note: Please allow a few seconds for the interactive view to load. Interactive view may not function on all mobile devices.